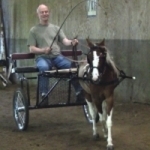 (HOST) Commentator John Killacky has discovered an essential inter-connectedness in the world of small horses that is also found in many facets of our Vermont lives. (KILLACKY) One year ago, we drove cross-country to settle in Vermont. First we found a place to live. Next, we needed a stable for our Shetland pony. Some dressage folks refused to even meet us because we had a pony. I guess we were not serious enough equestrians. One farm only boarded mini horses. Here we were too big. Who knew barns were so specialized? We eventually found the perfect place in Williston. Mozart was playing in the training arena. The boarders were intergenerational, important for two middle-aged men with a Shetland. Expanding our equine world, we went to a Draft Horse exhibition in Richmond and met Jean. We were invited to visit her family farm in Ferrisburg, and met their two drafts, one Hanoverian/Thoroughbred cross, two minis horses, and an extremely shy mule. Back at our barn in Williston, I was eager to begin training and inquired where to buy petite sized tack equipment. One of the more experienced riders put me in touch with her mother-in-law, Deb, who raises minis. Deb told me of an upcoming meeting of the Green Mountain Very Small Equine Association. It just so happened Jean was the guest speaker. I learned Deb had bred one of Jean’s two minis. About this time, I got a call from Meg, who had read an article I wrote. She had adopted a Shetland and wanted to connect with other pony people. I encouraged her to attend the small equine fanciers’ meeting at Deb’s home to hear Jean speak. After that meeting, Jean loaned harness equipment to Meg, so she could teach her pony to pull a cart. Later, when we visited Meg and her pony in Colchester, she mentioned she wanted to sell one of her larger two horses, as she did not have enough time for three animals. Coincidentally, another Meg at our barn was looking for a new horse. So, before long, Meg 1 from Colchester dropped off a dappled gelding for Meg 2 in Williston. Both Megs discovered they were the same age, born a week apart. You know that celebrity game where everyone in Hollywood is no more than six degrees of separation from Kevin Bacon? Well, I am learning that Vermont’s equine world has its own version of connectivity. I will soon be attending a clinic at Jean’s farm. Who knows, maybe Kevin Bacon will be there.